In the aftermath of the Fukushima meltdown, widespread superstition and primal fear regarding nuclear energy has gripped the hearts and minds of politicians, pundits, and faux environmentalists across the planet. But while tens of thousands were killed by the massive earthquakes and tsunamis in Northern Japan, no one was killed or seriously hurt by radiation from the Fukushima reactors. Of course, no one ever said that human beings were rational. Nuclear power is actually the safest form of power generation in existence, including all forms of renewables and hydrocarbons. Scientists and engineers, meanwhile, are working hard to make nuclear energy even safer than it already is. The innovation, which will not be tested for at least a couple more years, could lead to the efficient incineration of [nuclear] waste and a safer way to generate nuclear-powered electricity. The problem of radioactive waste, along with safety anxieties among the public, has long vexed the nuclear industry. The United States has wavered on whether to set up a long-term repository for long-lasting waste in remote spots such as Yucca Mountain, Nev. The UT scientists received a patent in August for technology that allows the pairing of nuclear fusion and fission to incinerate nuclear waste. Fusion produces energy by fusing atomic nuclei, and fission produces energy by splitting atomic nuclei. ...Called a Super X Divertor, the innovation is the sort of heat exhaust system only a nuclear physicist could dream up: It reconfigures electromagnetic fields within a fusion reactor, allowing the reactor to handle much hotter temperatures in more compact spaces. 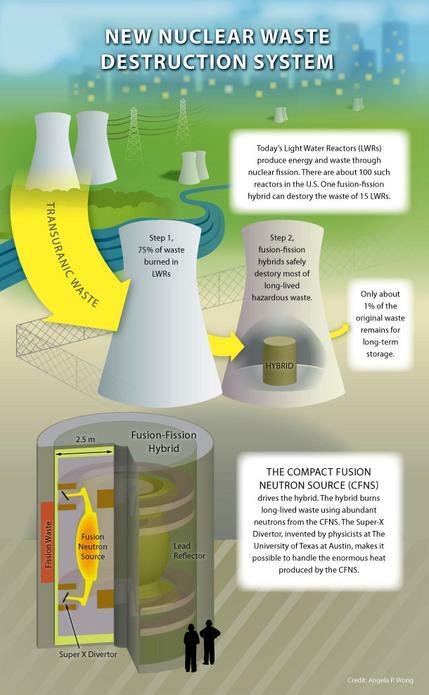 That innovation can allow fusion reactors to be built much smaller and allow them to be coupled with a traditional fission reactor for on-site incineration of radioactive waste. ...The byproducts of the incineration of radioactive waste should be far less radioactive, with a half-life of only several decades, compared with the half life of at least 10,000 years of reactor waste that has not been incinerated, said UT senior research scientist Mike Kotschenreuther. Mahajan said less toxic waste would be a boon in the U.S. and elsewhere. China is turning to large scale battery backup power for nuclear power plants. If the Fukushima plant had been using such forms of backup power as these batteries, it is unlikely that the word "Fukushima" would evoke such primal fear and pathological anxiety as it appears to elicit among the political, journalistic, faux environmental, and academic classes. And despite all the superstitious fears and fallacies that abound, post-Fukushima, several countries are moving ahead to install nuclear power or to expand pre-existing nuclear power plants. Poland, for example, is preparing for the construction of its first nuclear power plant. The UK is looking to China for help in expanding its own nuclear power infrastructure. Both China and Russia are planning massive expansions of their nuclear power. Several nations near the Persian Gulf and middle east are also looking to either build their first nuclear power plants, or to expand a pre-existing nuclear industry. Nuclear power -- including advanced, scalable fission, as well as scalable fusion -- is the only viable long-term, large scale power source that humans will be able to tap safely and cleanly for some time. Eventually, more exotic forms of power generation will become available to next level humans. Since advanced nuclear fusion and fission are not yet well developed, humans must use the energy sources which are available -- conventional and unconventional oil & gas, coal, geothermal, conventional fission, kerogens, bitumens, gas hydrates, geothermal, hydroelectric, etc. -- until the technology for scalable, safe, affordable, abundant, clean, advanced nuclear power is ready.